Moving is an exciting but hectic time. Whether you’re a new homeowner or a seasoned mover, it can be easy forget a few crucial tasks. To make the move easy for you, we’ve compiled a list of 5 things that you must do before you move into your new home. The name is self-explanatory. This is the very first bin you unpack once you move with all your essentials. These essentials might include things like light bulbs, toilet paper, a first aid kit, an extra set of clothes, a tool kit, or snacks and water bottles. You never know who might have an extra set of keys and you don’t want any unexpected (and unknown) visitors dropping by! You can install deadbolts yourself or ask the local locksmith to do it for you. The National Fire Protection Association recommends homes should have smoke alarms installed inside every bedroom, outside each sleeping area and on every level of the home, including the basement. Also make sure you have working fire extinguishers and plan an evacuation route in case of an emergency. It’s best to do this when the house is still empty and doesn’t have any heavy furniture, so you can easily clean every nook and cranny. PS: Don’t forget to wipe inside the cabinets! Change Your Address With Your Utility Companies, Credit Card Company, The Post Office, etc. This one can be easy to forget once you’ve settled into your new home. It’s no fun dealing with a missed payment because you didn’t receive a bill. 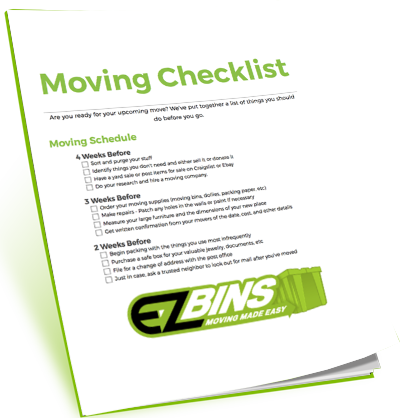 To make your move even easier, try our bins! We deliver them to your door, you pack and move your stuff, and then we come to your new home to pick up the empty bins when you’re done! Guaranteed to be cleaner and safer than cardboard boxes!